Applications folder gone from Mac and want know how to get it back? Read this post to get easy methods to restore missing Application folder to Finder or Dock. Applications folder in Finder shows all your Mac apps and you can quickly manage your apps in this folder, no matter the apps are downloaded from App Store or websites. 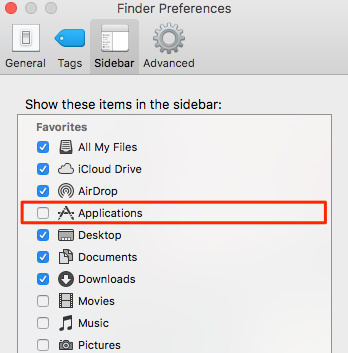 If you can’t find the application folder on Mac, it may cause you inconveniences, for example, deleting apps. So how to get the lost Applications folder back on MacBook/Mac mini/iMac? Keep reading on this post to get the answers. Step 1. 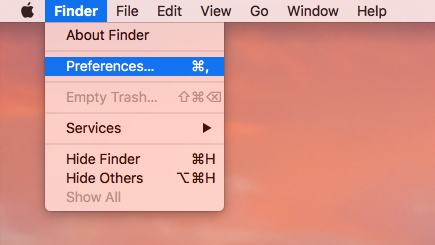 Go to Finder Menu > Click Preference. Step 2. Choose Sidebar tab and re-check Applications. 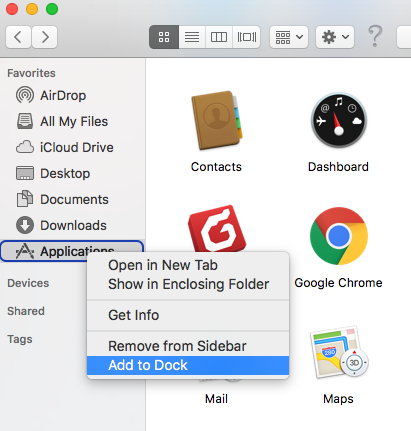 After restoring the Application folder in Finder, you can add it to Dock to quickly access Applications on Mac. Step 2. Right-click the Applications icon in the sidebar and choose Add to Dock. Step 3. Then you can right-click on the folder on the Dock to set how you would like it displayed, i.e. Fan, List, Grid, etc. That’s all for how to getting missing applications folder back on Mac. If you find this post helpful, please share this post to help more people. By the way, if you want to have some useful apps, click here to get 18 useful apps for Mac. The best tool to keep your Mac clean, fast and secure from malicious threats & spying eyes, and work in best state!